The catastrophic failure of the Japanese power plant in Fukushima has divided Europe over the future use of nuclear energy. In almost every country, there have been calls to reassess the risks and benefits of nuclear power and to slow down the construction of new power plants. The European debate raises some critical, and difficult, questions. Thus Hanns-J. 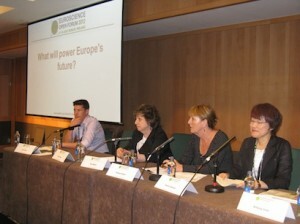 Neubert organised a workshop on 2012-07-15 during the EuroScience Open Forum ESOF2012 that explored the societal, cultural and journalistic concerns. It looked at science journalism coverage of the tensions between science/technology, economical constraints and political purposes using the example of nuclear power and energy in general. Debaters triggered an audience discussion about old and new roles for science journalism in democratic processes using the example of nuclear power and energy in general. Read the detailed article about the discussions and outcomes on the page of the European Union of Science Journalists’ Associations EUSJA.